Another 27 people shot dead. Donald Trump being ever so constructive tweets that he hopes God will be with the people affected. I am sure that will help ! But the one thing you can guarantee is that no politician will do anything actually effective in trying to prevent it happening again. The Holocaust thread has noted there was also a mass shooting in Colorado. A two-fer. I saw that on the news not too long ago. Thank god it was only 26 dead and not more. God is awesome for preventing 27 people from dying. Too bad he couldn't save those other 26 but he is great for stopping it from being 27. I can't find the clues to connect this mass murder to trump like I can last week's mass murder of those bicyclists in New York. Trump said : "This is not about guns." What a smart guy. That would have fooled me entirely. A mass shooting, and it is not about guns. Goodness me. Lance Kennedy wrote: Trump said : "This is not about guns." It's not about guns. It's about lunatics with too easy access to guns. One of my cousins bought a four-door pickup truck so he could carry the guns he thought essential for everyday commuting from the enclave to the factory where he works. It's a five mile drive, all through farm country. "But there could be government tanks in any of those barns!" "Yeah, and they'd crush you like a bug!" "That's why I need more guns!" IIRC, about the first admin rule that Trump removed on taking office was a restriction of the right of people with mental problems to get guns. He IS an expert on this particular subject. Hmmmm...... seems to me if we all "sign up" to post on this thread that we declare ourselves to be knuckledragging lying incompetent miscreants unloved by our mothers and therefore that no slur or allegation could further lower our estimation in the eyes of our fellow man, that this thread should be immune from any claim of libel? I so claim this status for myself. I cannot be libeled. As a human being, I'm lower than a snake's belly in a wagon rut. I always thought that when America had a drunk driving epidemic, it was because we had too many cars on the road. Aztexan wrote: I always thought that when America had a drunk driving epidemic, it was because we had too many cars on the road. Tovarish! Da Rodina nyet have drunk driving thing! I don't think this mass murderer was a lunatic or otherwise mentally ill. Too easy an excuse. Pyrrho wrote: I don't think this mass murderer was a lunatic or otherwise mentally ill. Too easy an excuse. I heard he was admin on a forum somewhere. If you got half a mind to be a forum administrator that's all you need. Pyrrho wrote: If you got half a mind to be a forum administrator that's all you need. Here in Japan, we obviously must not have any mentally ill people - as evidenced by our lack of mass shootings. It is funny how many people ignore the simple fact that to get mass shootings, you need guns. In Europe, where guns are more tightly controlled, from 2009 to 2015, there were 19 mass shootings. In the USA, this year to the end of September, there were 307. Is it possible, there may be a link between gun availability and number of mass shootings ? It is funny how many people ignore the simple fact that to get mass deaths from "object X", you need lots of "object X". It is funny how many people are willing to sacrifice thousands of other people's lives every year in order to have the convenience of automobiles (or in the case of New York City, rental trucks). The standard response to that that is "We need cars, but we don't need guns" or "Cars have a legitimate purpose, but guns do not." And that is where the disagreement lies. Some people are of the opinion we don't need guns, and some people recognize that guns do in fact have a legal and legitimate purpose. We have had this conversation before. Nothing has changed. Nothing will change. You can keep flogging a dead horse, or not. At least with cars, one can choose to drive or not, and ones skill, knowledge, and self-control vastly improves your chances of never having an accident or becoming a victim. Quite unlike assault weapon availability, which leaves victims entirely at the mercy of the deranged other. bobbo_the_Pragmatist wrote: IIRC, about the first admin rule that Trump removed on taking office was a restriction of the right of people with mental problems to get guns. Correction: What Trump did sign a bill that was passed by Congress. Further clarification: That bill canceled an unconstitutional restriction on certain people. Everyone who buys a gun from a dealer still has to pass an appropriate background check. What Obama tried to do was to put a certain group of people in the "national background check database" without going through due process as required by the fifth amendment. Congress overturned Obama's unconstitutional action. This country still stands for the principle that you cannot infringe someone's rights without due process. My argument there is that the use of cars is subject to massive restrictions to minimise the carnage. The use of guns is not. How stupid is that ? You think that letting people classified as mentally ill have guns is a "right" . What about the right of ordinary people not be be shot and killed by those who are insane ? There is no doubt in my mind, and I think, in the minds of all rational people, that the incredible number of mass shootings in the USA is fuelled by easy availability of guns, including military style weapons designed for mass slaughter. Last edited by Lance Kennedy on Tue Nov 07, 2017 7:56 pm, edited 1 time in total. TJrandom wrote: At least with cars, one can choose to drive or not, and ones skill, knowledge, and self-control vastly improves your chances of never having an accident or becoming a victim. And yet the number of people killed each year from drunk drivers is about the same number as gun homicides. TJrandom wrote: Quite unlike assault weapon availability, which leaves victims entirely at the mercy of the deranged other. It's not true that victims are "entirely at the mercy of the deranged other". In the Sutherland Shooting, a neighbor used his "assault weapon" to chase away the shooter. It is unknowable how many lives he saved by doing that. Furthermore, the number of deaths each year from mass shootings with an "assault weapon" is a mere handful compared to the ten thousand or so drunk driving deaths. They are not even close to being comparable in the damage done. There are 100,000 people each year in the USA who get a bullet through some part of their anatomy, even not including suicides. Drunk driving does not do that. Lance Kennedy wrote: On cars. It's not stupid at all. It is merely a difference of opinion. Secondly, what restrictions are you referring to that are imposed on the usage of cars to prevent them from being used by drunk drivers? You think that letting people classified as mentally ill have guns is a "right" . If a person has been legally classified as mentally ill in accordance with due process as required by the fifth amendment, then I agree that is a legitimate infringement of their right to buy guns. That is one of the many compromises I am willing to make regarding the Second Amendment. What Obama tried to do was infringe the rights of people who had not been legally classified as mentally ill.
Lance Kennedy wrote: What about the right of ordinary people not be be shot and killed by those who are insane ? What about it? They still have that right. I cannot speak for the USA about policy on drunk driving. Here in NZ, it is severely policed. The penalties for drunk drivers are nasty, and the policing is stringent, with "booze buses " equipped with breath testing on the road frequently. I have been pulled over and tested three or four times, and I never drive after drinking alcohol. But guns in the USA get free reign. People in the USA do NOT have the right to avoid being shot by the insane, when the government is not acting to prevent it. Lance Kennedy wrote: There are 100,000 people each year in the USA who get a bullet through some part of their anatomy, even not including suicides. Drunk driving does not do that. Drunk drivers cause more than twice that many injuries per year. Lance Kennedy wrote: There is no doubt in my mind, and I think, in the minds of all rational people, that the incredible number of mass shootings in the USA is fuelled by easy availability of guns, including military style weapons designed for mass slaughter. There is no doubt in my mind, and I think, in the minds of all rational people, that the incredible number of deaths by drunk driving in the USA is fueled by easy availability of cars and alcohol. Lance Kennedy wrote: People in the USA do NOT have the right to avoid being shot by the insane, when the government is not acting to prevent it. By that same logic, people in the USA do NOT have the right to avoid being injured or killed by drunk drivers, when the government is not acting to prevent it. Is your government failing to take action to minimise drunk driving ? It surely is failing big time to take action to minimise mass shootings. The alternative seems to be atheistic terrorism, but that qualifies as lunacy IMO. The killer in NYC is also a lunatic. Shouting "God is Great" before killing strangers is not evidence of mental health. It's not evidence of collusion with al Qaeda or ISIS or the Taliban (or Saudi Arabia) either. Both the Uzbeki guy and this guy in Texas were lone wolves with delusions of grandeur. Trump (and Obama and Bush) is similar, but he has an army. I think it's too simplistic and too easy to say that a terrorist or a mass shooter is "mentally ill", and I think doing so leads to ignoring other possible motivations, for example, drug and/or alcohol abuse. There is also the aspect of notoriety; I think many news outlets do us no favors by publicizing photos of the killers and their backgrounds, manifestos, and whatever else. I do not delude myself into believing that anything will change. Lance Kennedy wrote: Is your government failing to take action to minimise drunk driving ? I like: Calling mass shooters insane is too easy. Thats true...but "something" is going on there. How about: "Every mass shooter is being anti-social?" And that fails because the religious types are being social conforming.... just to a group/values we don't like. Soup: thanks for the correction on Trumps legislative record. I remember he did something but thought he had zero legislative actions. I was wrong. Not as wrong as you are in your incessant reference to guns are ok because cars are ok. Its the reverse that is more true: guns are not ok, because cars are not ok. Because of that, we very closely as best we can regulate the later, but not the former. so...to the degree your analogy is useful, you hold the wrong end of the stick. The ONLY argument you have, is that the Supremes are just as nuts as you are........or there are nuts somewhere? I think (again.....everything is again on this subject) the Supremes fail to apply the different levels of lethality of the tech when the 2nd Amend was written to what guns are today. Easy to correct...... just apply original intent (and circumstances) to correct this bad path we have gone down. Then......let Majority Will reign. I expect guns would be outlawed........well before cars..........because arguing cars is .......... nuts. I'm willing to say that anyone that mass shoots a bunch of strangers, or even well known folks such as ex-work place workers, is close enough to nuts to forego the fine shadings? What interest is given short change by such overbroad application? They may not be "all nuts".... but there are nuts somewhere. The Texas shooter for instance....kicked out of the Air Force for domestic violence: cracked his baby's head, put wifey in the ER several times. Still not all nuts....but nuts are invovled. Don't they ALL need psychiatric help..... even after the fact if still alive? If you need/get help from psych services.....aren't nuts somewhere in the picture? At least that answer is sensible. But if the government is currently failing, then what, in your view, should it do to minimise both ? Well done Lance. I expect the response if anything more than two worlds to say "do nothing." I can get it down to four: "I've answered that before." Its like a catchy tune: stuck in one's head. That's a complex issue. I don't have any answers, merely some conjectures. On drunk driving . . .
For mitigating drunk driving, at least in the long term view, it seems that driverless cars might be a good solution. In the short term, stricter penalties for drunk driving might help. I'm very much in favor of that. Another possibility that doesn't seem to have gotten any traction on a large scale is to offer free rides to any drunk who needs to get home. Paid for by private charity. I am opposed to using taxes to pay for that. On mass shootings . . . Most mass shootings occur in so-called gun-free zones, where the shooter knows in advance there will not be anyone there to stop him, at least initially. Perhaps it would be helpful to deny potential shooters that advantage. In two ways. 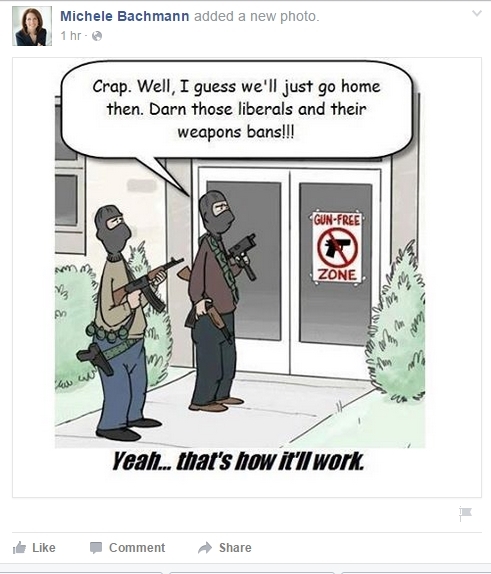 One, do away with most gun-free zones. All they do is create defenseless victim zones and give a false sense of security. The bad guys are already violating the laws against killing people, so why should they be bothered about violating a stupid gun free zone? Get rid of them, or replace them with this next solution. Secondly, consider the actions taken to minimize shootings in banks and various other potential targets. They have armed guards. After the shooting in 2012 at Sandy Hook Elementary School in Newtown, Connecticut, more schools have gotten armed guards or have allowed staff the option to carry guns for defense. It's too soon to say if this will mitigate the problem in the US, but this solution is known to work in other countries. Perhaps this solution might extend to churches? Speaking of which . . . In the Southerland church shooting, which is the topic of this thread, a neighbor used his "assault weapon" to prevent further deaths. It is not possible to know how many more people would have died if not for that good guy with an "assault rifle". When seconds count, the police are mere minutes away. Which is why it usually helps to have armed good guys near by. One solution that is not workable in the US, is to ban so-called "assault weapons". We have already had that discussion. Another proposed solution that is not workable is so-called smart guns. That solution is problematic for several reasons. Otherwise, I am not (yet) aware of other possible solutions that do not infringe the fundamental rights of millions of Americans. But I am certainly open to considering other proposals.